Since 2008, we have been offering RV and Tent camping along the North Fork of the Maquoketa river in eastern Iowa. Our love for nature is the reason we started Riverview Ridge Campgrounds. When we purchased this land, we enjoyed walking the timber, floating the river and watching all the wildlife. It was just too much for just us to enjoy and so we knew that we had to share it. So began our dreams for our Eastern Iowa campgrounds. 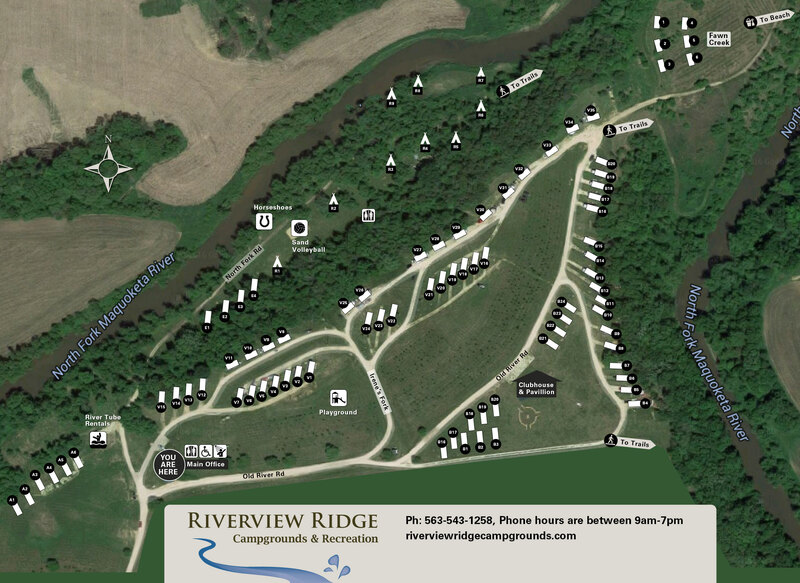 Riverview Ridge is a full service campground equipped with RV and tent sites. We are located along the North Fork of the Maquoketa River in eastern Iowa, the heartland of America. You'll find us among the limestone bluffs and lush riverbanks near the cozy town of Cascade, Iowa. We offer tube & kayak rentals, hiking/walking through our additional 80 acre terrain, and more. This season, we're again expanding our Eastern Iowa RV parks to meet your growing demand and adding sites, grooming walking and hiking trails and adding features to our popular river tube rentals. Stayed with us before? Share your ideas on how you'd like to spend your Iowa camping vacation and thanks for making us one of the top ranking Midwest campgrounds. We are adding more seasonal summer sites every year. Added a three-seasons building and pavillion for campground activities such as movies, games and for your rental needs. Planted 1500 trees: Jack Pine, Maples, Oaks, and more. Expanded our tubing services by adding a private tubing storage area for faster service. Added a camp store for your convenience to purchase ice, camp supplies and fishing gear. Added more electric sites along tree lines for weekenders. Added more riverside tent camping. Feature group activities for all our campers. Added more staff to keep our customers happy.